I received an e-mail from Ben Mueller that I wanted to answer on the site, as he asked some of the same questions I’ve been getting asked a lot lately. First, what is the difference between an ARG and a RPG? I read a few articles about ARGs but this seems to me to be a subtle difference. I am hoping you could shed a little light on those nuances for me. The reason I ask is because I teach social studies and have already created a year long role playing project. I am hoping I can use that as a foundation for an ARG. A RPG, or Role-playing Game, is a game where you, the player, take on the role of a character in a fictional world. You play as someone else in a world that does not exist. This is a more passive experience, usually with a controller in hand, where you play out someone else’s story as someone else. An ARG, or Alternate Reality Game, is a game where you ARE the character in the game, and the game takes place in the real world we live in. This is an active experience where you play out someone else’s story as yourself. This Cracked article lists the five best ARGs of all time. Check it out if you want some real-life, non-classroom examples of ARGs. The Batman one looked epic! In my classroom ARG, TwentyTwenty, my students are being contacted by a girl from the future named Sammy. Sammy is reaching out to my students by hiding coded messages in their work. When deciphered, the coded messages tell them what to do and where to go; they must physically do something. When they get there, they must solve a puzzle. Solving the puzzle reveals a piece of the story told through transmedia. They are playing as themselves and interacting with the real world. No controller needed. By not acting, students could put the desired outcome of the game, saving Sammy and the world, in jeopardy. An ARG is a living, breathing world and doesn’t always wait for the player. An ARG is real life. Second, when it comes to the story of your game you mentioned writing storyboards. I have never written anything as detailed as I envision this project being, and was hoping you had a few storyboard examples you could share? My students are far enough along in the game that I am willing to show the first part of my storyboard. The thing to understand about ARGs, though, is that they are player driven and the Puppet Master, the person running the ARG, has to be flexible when mapping out the story. Don’t plan out every detail of your story; plan out a basic story line. Here is my storyboard. It is not nearly as detailed as you might have imagined. I wrote this last July. Some of it no longer applies to the game, as the game has changed based on what the kids did. What is important to realize is that I am making up most of the story as I go. As the Puppet Master, I monitored students’ conversations and tailored the game based on what they were saying and doing. You should try to conform the story to where students are trying to take it. This gives the feeling that they are really driving the story. Make a basic story and let students fill in the blanks. 1. The first thing I did was create my story using a timeline of events. From this timeline, I could plan what transmedia I would make to tell the story. I’ve made newspaper articles, magazine covers, and “scenes.” I’ve made fake advertisements, Google+ profiles, Twitters, phone numbers with answering machines, etc.. You name it, and there’s probably a fake one out there belonging to one of my characters. 2. After the timeline, I created three BIG, elaborate puzzles that would lead to a significant event happening in the game, in turn, ending an “Act.” I was aiming for the end of each Act to coincide with the end of each Marking Period, but, as you can see, they are a bit behind. 3. Finally, I fleshed out how I wanted the story to go each marking period. I made sure to write in a twist for the end of each act. The first twist was deliberately using the name Sam along with a pixelated picture of her. I think most of my students thought Sam was a boy, but when it turned out to be a girl, I hope I surprised a few people. I’ve blacked out things we’ve yet to come to in the game, but there are two more big twists in the game. Not pictured: I have a Google Sheet with 85 different coded messages and puzzles. Many were planned in advanced, but some were made up on the fly and added later. Here are the headings, so you can get an idea of how I organize them. Also not pictured: I made a “character sheet” for each character. This forced me to get detailed about my cast of characters. I may never use even half of what’s on the sheet, but by planning out the characters in detail, they became real people to me… that live inside my head. This makes it easier to do things as them, like Tweet, because I’ve given them their own back story and personality. On this sheet, I also include characters’ phone numbers, important things they’ve said during the game, and passwords to their social media. Google Character Sheet and use anyone that you think would work well for you. Finally, I really liked the setup of your game using GoAnimate.com. When I did my role playing project with kids in the past, one thing that frustrated me was that some of them had difficulty differentiating between the project and actual history lessons. I checked out their site, and I really think it is a great idea. My question is which version do you use, and do you also have an example video you have created or a link to a video you could share so I could get a better idea of how you are introducing the game content? First, allow me to address why I use GoAnimate. One of the coolest parts about playing an ARG is the This Is Not A Game (TINAG) mentality that players adopt. When you suspend disbelief and imagine that an ARG is happening right now, in the real world, and your actions matter, it increases the fun exponentially. I wanted my students to really think TwentyTwenty was happening. I wanted them to care about the characters and want to save them, but as a teacher I also had to make sure they knew what was part of the game and what wasn’t. 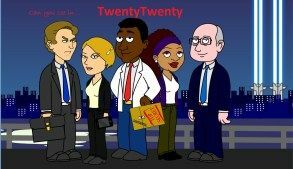 The kids know that any transmedia that is part of TwentyTwenty is made in the GoAnimate style you see below. If they find a Twitter or website and it doesn’t have a GoAnimated character on it, it’s not part of the game and can be safely ignored. As for version, GoAnimate changed their pricing tiers while I’ve been a customer. My bill says I am a GoPlus member and it cost me $6 a month. I don’t know what I am getting for my $6, but I haven’t had a problem making anything that I’ve wanted to so far. I don’t know if I’ve been grandfathered into one of the more expensive tiers, but I will send them an e-mail and get to the bottom of it. Either way, it is a great product and they are a great company, so don’t be afraid to use them. Looking at the Money magazine cover, one may not initially notice the QR code or think that it works since it’s so pixelated, but it does! Scan the QR code on Malus’ Money magazine cover to see a message from Sammy. The way students get the transmedia story, again, is by deciphering codes hidden in their work. These codes lead them to puzzles like the Money magazine cover. And by figuring out the puzzle, the fact that the QR code works, is how they get the messages. Or another example: click on the star in the Evermoore Energy logo on the TwentyTwenty homepage. You will get another message from Sammy. Think of getting codes and puzzles out to your kids like hiding Easter Eggs. Finding them is half the fun! Sorry for the length, and thanks in advance, your blog has been immensely helpful in giving me some direction. I’m happy my site has helped you out. If you or anyone else needs some help, don’t hesitate to ask!